“Mr McCain died on Saturday surrounded by his family, a short statement released by his office said. It’s important to examine and note the special qualities of public service and devotion to nation of the United States as a melting pot of different peoples, standing together, joined by a common striving towards the diverse abstract noble goals of fairness, nobility of spirit, National Pride and, in addition, an ability to project American Power and values abroad. At a time when he stood against Barack Obama for President, he strongly corrected a heckler demeaning Obama, (his political opponent), by clearly pushing back and declaring that Obama was instead a noble patriot who merely had differing political views. This one act summarizes his character as a unifier and open to all irrespective of background. From then on, John McCain came to represent a standard bearer for the best in values of respecting others and trying to isolate the Republican Party from the racist fringe extreme right. 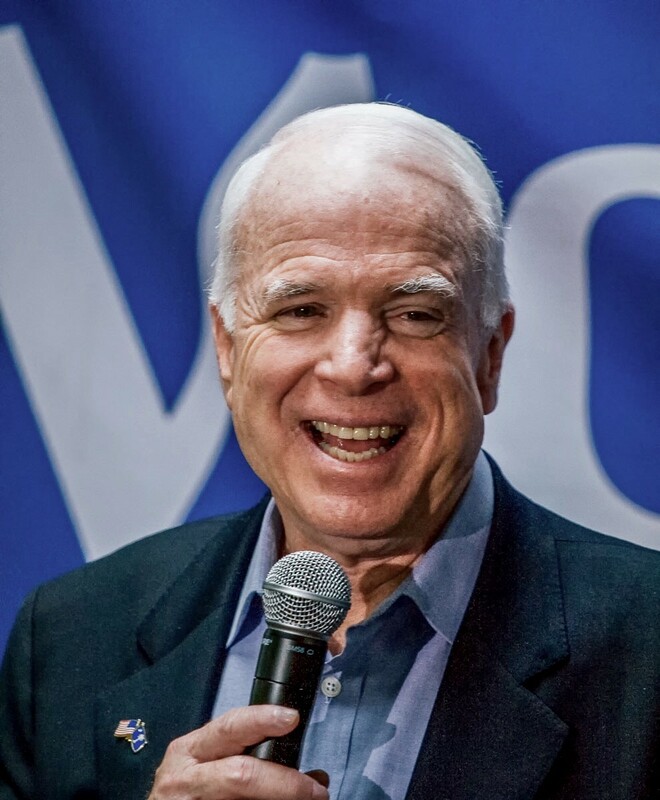 With the rise of “Trumpism”, McCain represented the antidote to the Trump base’s embrace of hate speech towards Blacks, Hispanics, Jews and the Press. There is currently no replacement, as the backbone of the Republican Party is cowed by fear of the 90% of Trump voters who would punish any Republican Senators or Congressmen, (who would denounce Trump’s behavior), in the coming “Mid-Term” elections in a few months. Had he picked anyone other than Sarah Palin as his running mate, I would have immediately jumped ship and voted for him. I did admire him so much, especially for standing up to those people who still held the belief that Obama was not a "real" American. The man had chutzpah and when needed, had a set of cajones which allowed him to go toe to toe with anyone, including the whiner Mitch McConnell. That the bone spurred, draft dodging Herr Gropenfurher would challenge McCain's bravery because, "I like heroes who don't get caught," was beyond insulting and every military person in the Armed Forces of America should never vote for Trump again. Thanks for your wise words. He is lucky the military don’t turn their backs on him! I took this of McCain 2008 in South Carolina. See he is wearing the SC flag pin. RIP, John McCain a true American hero. ...and genuine as a human being, citizen, husband and father! Thanks for this picture of a truly approachable and humble man, devoted to duty to such an extent, that even massive support by the NRA does not diminish by one iota my admiration! He has earned his pass in blood, tears and devotion to us all! "John McCain was a great statesman, who embedded the idea of service over self". I did not agree with everything he said, but I respected his devotion. Your important words are so valued here! We do expect politicians to be imperfect as there’s a huge pressure to gather funds for election campaigns. That leads to some measure of compromise. However, ultimately, wherever we are on the planet, one needs representatives who are decent human beings who value other people’s humanity and treasure the worth of folk of every background. It’s this bottom line, which for McCain was not negotiable, which separates him above the crowds of others who profess pride in being American. The latter after all is the lowest level common thread of even the most fascist of xenophobes who wave flags while separating us according to race, religion and sexual preference. So take away the flag and what do we have? A person that a nation would be proud to own and call their son! I have been a fan of Senator McCain for his service, and his following what he felt was the right thing to do for country. I didn't always agree, but knew he was always doing what he believed was best. I had the privilege of meeting him years ago. Godspeed, Senator. Thanks for your heartfelt comments and wishes. John McCain at his best was a voice of honor, example, patriotism but never xenophobic extremism. I didn't agree with him on his backing by the NRA, but this was a Faustian bargain that allowed him to place his voice on the national stage. Sources of funding support are a thorn in the flesh of democracy, but he still rose above his fellows for justice and the rights and dignity of all irrespective of origin and creed. It is hard to think that his pal, Lindsay Graham would be on his current extraordinary right-wing track if the good voice of his dear friend, John McCaine has been still in his ear. We need such voices as we are still bound by our tribal and selfish inclinations. We can best remember McCaine's service by supporting those who speak fearlessly without creating divisions, holding up our for value of the American Dream for all in our bountiful lands. My prayer is that there are more young McCaine, young men and women, in incubation in the halls of colleges and factories, farms and offices who will take on his mantle. Our future is not in nationalism but in nurturing the individual and so strengthen the core of the nation from the people, for the people, by the people, as the US Constitution wisely declared. Your attention to McCaine's legacy is opportune! It is nothing to do with tribal politics or fame and fortune, but all to do with principal of honor, law, equality, respect for citizens and treasuring each other's children as our own.